With traditional radiography, the film serves as the means of image acquisition, display, and archiving. DR splits those components between the CR cassettes or digital panels that acquire images, monitors that display them, and file servers that archive them. CR’s arrival onto the scene in the early 1980s put PACS on the path to becoming a necessity for hospitals. Small facilities are the last frontier for PACS. Small hospitals—certainly those with fewer than 100 beds, but the definition is a bit fuzzy—and freestanding imaging centers are the last places digital imaging penetrates. At the Society for Imaging Informatics in Medicine (SIIM) meeting in June, an industry panel on CR and DR pointed out that nearly all hospitals now use PACS. A recent survey and report from IMV Medical Information Division reports that 99% of hospitals with more than 100 beds have PACS. Speaking in a different SIIM session, James Whitfill, MD, of Scottsdale Medical Imaging estimated that 40% of freestanding imaging centers do not use PACS. Whitfill noted that many of these are small imaging facilities, and these same smaller imaging facilities also represent the battle lines in the competition between DR and CR. Experts see CR’s versatility and lower cost as the factors that will keep the technology in the marketplace. While it won’t be anytime soon, the implication is that CR will fade away in the U.S. market at some point. The current U.S. PACS market is predominantly replacement systems and systems for smaller facilities. How CR and DR fit into that scheme depends largely on whether a facility has sufficient volume to support the higher cost of digital flat-panel detectors when it makes the transition away from film. “That is the business you are replacing with these small CRs,” Minnigh said. “In fact, that is the growing part of the CR business.” He noted that these smaller facilities with modest volume will be the market for CR in the long term. 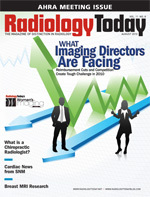 While the majority of exams were and still are projection radiography, CT and MRI account for an ever-expanding number of PACS images thanks to the large numbers of exams per study in those modalities and the growing number of CT scans, which mushroomed from approximately 3 million in 1980 to 72 million in 2007. While CT, MR, and digital mammography are increasingly driving the future of image archiving, the PACS world largely came to be because of CR.